12:50pm HOH room Angela and Tyler are still sleeping. 1pm Kitchen. Kaycee and Scottie. They talk about random things from their lives outside of the house. They talk about sports and Scottie talks about the last fight he has with his brother about a toaster. 1:58pm Bedroom. Tyler and Sam. Sam – What is supposed to happen? What do you want to happen? Tyler – I don’t know. Sam – you’re not going to tell me what to do? Tyler – I don’t know. You have to ask like Kaycee and JC. Sam – why? Tyler – I know what I want to happen but I don’t know what everyone else wants to happen. Everything is different so.. Sam – Oh well then what is it? Tyler – I think I want Scottie to stay but I don’t know if he is going to stay. Sam – Why because Kaycee and JC don’t want him to? 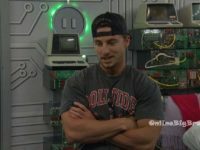 Tyler – well not them specifically but I don’t know I think everyone is just scared of Scottie because we already voted him out. You’ve got to win the HOH next week. Sam – why? Because they’re all going to vote me out? Tyler nods. Sam – Oh f**k! It has to happen. It’s the routine we’ve all fallen into. Tyler – just make sure you try your hardest because it might be a double (eviction). Sam – oh you don’t think it’s this week. Tyler – I think it is this week. You win. Just win. Sam – okay. I remember way back first week, second week Brett and JC wanted Haleigh to go.. I don’t understand how she’s still here. Tyler – I don’t understand either. Sam – I feel like she does sh*tty things to people. Tyler – she is always up in the HOH room. She won’t leave me alone. Sam – I think she does intentional stuff to people to f**k with them. Tyler – I want her to go. Sam – I don’t understand why she is still here. Tyler – because she can’t do anything. She’s not a threat. Sam – well she was clinging to that rope like a parasite. Tyler – I know. Sam – the reality that I am still here blows my mind. Tyler – no it shouldn’t. I won’t let people do that. Sam – so how many times have they had an idea that you defended me from and kept me from going up there. Tyler laughs and says a few times. Sam – really?! That surprises me. Why does everyone want me gone? Tyler – it’s just because you’re solo and no one knows where your head is at. When people don’t know what’s going on in someone else’s head they freak out. Sam – well its very obvious who I enjoy being around and who I don’t. The only person I don’t hang out with is Haleigh. Tyler – Haleigh’s been pushing pretty hard for you to go that its giving other people reasons why you should go. Tyler – we’re good but if Haleigh wins she will put you up. Sam – well obviously. Tyler – that’s why you need to win. Sam – I didn’t come here with an expectations and if I was in the final two with you I would be honored, thrilled and shocked. I would honestly feel like I couldn’t take it over you. Tyler – that’s not up to us. All we did was pinky promise. It’s up to everyone else to decide who wins. It doesn’t matter. I’m not even worried about that, I just want to get to the end with you because we made that promise. Sam – that would be so magical if we made it to the end and I would be so happy if you won. Tyler – start winning things. Sam – I will try. We’re down to the strongest competitors now. JC hasn’t won anything, why aren’t people attacking him. Tyler – I’m sure they would eventually. Who would we want in the final 4? Tyler – based on this week there are a lot of routes it could go you know? Sam – honestly I would be happy with anybody as long as it ends up you and me in the end. Tyler – it would be who we could beat in competitions. Sam – I would say Kaycee and JC. Tyler – I would too. Sam – or Scottie. I love Scottie. Tyler – I do too but Scottie is hard to beat. Sam – I look at it personally like who would be most deserving. Tyler – I know but you have to tell yourself you’re most deserving. Sam – after Rockstar left I asked Brett if he was with her and he said no. So I asked him if he would be my person. Its lonely being in here and I had to tell myself to pump the breaks. I am not attracted to him in the least but he is fun. I think he’s a closet nerd. I would never do a showmance thing. I took a strong stance against it. I came in here with a broken heart. The only commitment I made in here is to you. I really do trust you. And I need you to do the same. Tyler – I do. Sam – out of all the people in here you’re the person I feel closest to. I hate that we never get to hang out. Tyler – I know. 2:50pm Brett, Haleigh and JC in the havenot room. 3:30pm – 3:47pm Havenot room. Kaycee and JC. JC – tomorrows going to be crazy. Kaycee – GBM’s today. (Goodbye messages) JC – I was just thinking how crazy its going to be tomorrow… getting out Scottie. Haleigh can’t get that HOH. Kaycee – if Haleigh wins she would probably put Sam up .. and if only one of us is up we’ll be fine. That’s the worst case, which isn’t that bad. (Worst case would be two of you up.) 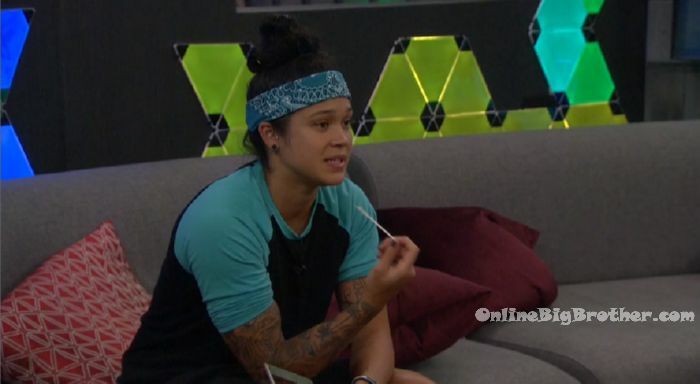 Kaycee – we were thinking the Double might be next week because then everyone plays in the veto .. if its this week we have to pick players which takes up time. JC – Yeah that makes sense. F**k then we have Haleigh for one more week. Fes was talking to Brett about how sh*tty he was and he told Scottie to be careful with Kaycee. Do you actually realize you made it this far in the game because of me. Honestly. Kaycee – he told Scottie to be careful of me? JC – no, of me. I don’t know if its still him (Scottie) and Haleigh and its Haleigh making him say all that. I don’t know. People are literally playing emotional games. Emotional as f**k. I told Fes before that I was going to vote him out. Kaycee – well he is out of the house now. JC – its stays inside you like why someone is so sketchy. Kaycee – it just seems like that’s how he is. He’s bitter. He’s salty. JC – Haleigh said that she misses him (Fes). Scottie was b***hing to me that she has a top two with half the house. Which doesn’t surprise me. Kaycee agrees. I don’t trust both of them. JC – I was like how are you (Haleigh) walking around the house laughing and having so much fun when you literally tried to f**K over every single person in this house. Angela, You, Tyler, me.. and then Sam hates your guts. 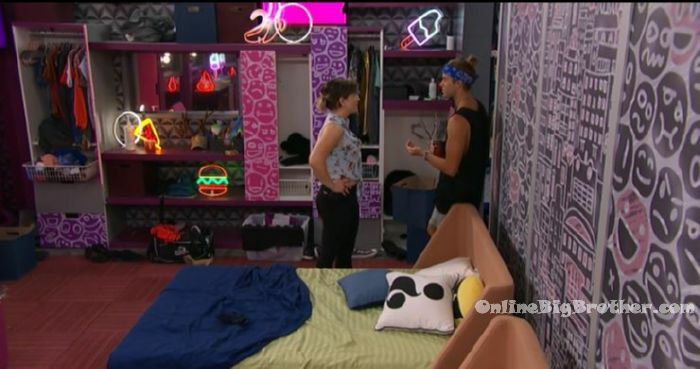 Kaycee – you can tell she is fake as F**k. JC – I don’t believe anything she says. Kaycee – I don’t either. JC – that’s why why you said maybe we should get her out .. my eyes went like (opened wide). Maybe!! Kaycee – but we can’t. JC – I know I already made up my mind that we can’t. Scottie joins the to look for he things. Scottie – don’t let me bother you. JC – we’re talking about gay things. Scottie – then I should definitely be included. Scottie leaves. JC – I tried to get Haleigh to come our way.. but then she gets the hacker and put up Tyler. Then she gets HOH and puts you and Angela up. What the f**k?! Kaycee – we’re looking good. JC – its probably the first time two gay people make it all the way. Kaycee – yeah. Kaycee leaves. 4:38pm – 5:05pm HOH room. Kaycee and Tyler. Kaycee – so the plan this week .. we vote out Haliegh. Tyler – I’m going to have a heart attack. Is it!?! They laugh. Tyler says hes got a headache because he’s stressing out. Kaycee – why are you stressed? Tyler – what’s wrong with you. I feel like you’ve been sad the last couple days. Kaycee – oh no. no! If anything I’m just bored. All this waiting and sitting around. Why are you stressing. Tyler – I don’t know just worried about you and Angela being stressed. Kaycee – are you guys getting closer? Tyler – I guess. Kaycee – did she make a final two with you? Tyler – no. She wont even touch that subject .. which is good. I don’t want her to. I think she is dead set on battling it out at the final four. I am just worried about JC. Getting into Brett’s head. Kaycee – I have no doubt. JC can say whatever. Are you really worried. Tyler – a little bit. He brought up that you and Angela are a duo. Kaycee – are they still bringing that up? Tyler – yeah. Which bothers me because I don’t want to tell Angela and make her think that we’re not solid. Kaycee – yeah. We made our thing before level 6.. I haven’t made anything else after that. I trust you and Angela the most. Tyler – I would choose you over Angela. And I know its going to come down to that. Kaycee – at the end of it we will be okay. Its just a game. Tyler – it makes it easier knowing you and I have been together since the beginning. Kaycee – she (Angela) with understand. She will respect it. Tyler – I am basically worried someone will take a shot at you two too early. Kaycee – I think JC is worried about me getting too close to Haleigh. I told him she is fake. I don’t do fake. They talk about no one has suspected they’re working together. Tyler – not even Angela. 5:15pm – 6:15pm Scottie teaches Sam how to play chess. Sam – this game makes me feel like I am dumb. 6:25pm Brett working out. In the background JC says the they should have given Rockstar a c@mel toe blocker. Something that doesn’t let the clothes go inside the v@g!na. The cameras switch to Angela and Haleigh in the bathroom. Angela – I am the same person I was yesterday. Simple thoughts. Haleigh – just good to check in. I just want to know or not. Angela – you still have my vote. 100% Hundo-P Haleigh – you have no idea that means to me. No idea!! Angela – I was up till 5am this morning just rolling around. I was dead this morning. Haleigh – because you were talking or because you couldn’t sleep? Angela – because we were talking and then I couldn’t fall asleep after she stopped talking. I was so frustrated and wired. 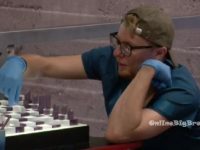 7:15pm – 7:50pm Scottie and Sam are still playing chess. After they’re finished their game they continue talking about random things.. like movies and books. 7:22pm – 8:22pm Kitchen. Tyler, Kaycee, JC, Angela, Brett, Sam, Haleigh. They talk about Big Brother Canada. JC comments on how he liked BBCAN Ika’s boyfriend. We didn’t get anyone like that in this cast. Tall, muscular, good looking.. I guess they tried with Fes .. but that didn’t work. I’m joking, we had the more muscular cast. Haleigh – whatever. The house guests are hanging out chatting about random things. 8:26pm Bedroom. Brett and Haleigh. Heleigh – I am exhaused from the past two months. I haven’t done sh*t! I literally haven’t done anything. I just stay up and stress. Brett – agrees. 8:40pm HOH room. Tyler and Angela. Angela – I don’t even know what to say so that it sounds like we don’t talk to each other. Tyler – platonic. Angela – I’m thinking of what to ask you but nothing comes out. Tyler – Kaycee asked me about that .. saying she heard us talking random, normal conversation like we don’t know each other that well. Tyler – nice! Angela – yes! I wonder if Scottie knows he is going home because Sam literally spent 6 hours together. 8:45pm Bedroom. Scottie and Kaycee. Scottie – when I was on the block with you apparently there was a final four deal offered. Fes & Haleigh went to Angela and Tyler. Kaycee – oh… Scottie – you didn’t hear about all this? Kaycee – Ahhhh.. nooo. Scottie – that’s why you were the one that got put up because they were trying to show they could trust those two (Angela & Tyler). In that meeting I was still on the block and those two (Fes & Haleigh) were supposed to be on my team. I heard that I got thrown under the bus in that one. Kaycee – who told you about that? Scottie – literally four people told me about it. I thought that got spilled while I was away. I thought everyone knew. Kaycee – no I knew about them being up there talking but I didn’t know about the final four. Scottie – well Tyler and Angela shut it down because they knew they only wanted safety. Kaycee – right, that’s what I heard. Scottie – I also heard that Haliegh has 5 final two deals which I confronted her about and she denied. Kaycee – seriously?! Scottie – me, Fes, Bay, Rockstar and Kaitlyn. Kaycee – really!? 8:58pm Big Brother tells the house guests to check the store room… BB gave them beer and wine..
Wow! What a great conversation with Tyler and Sam! ? Sam is such a character! She’s like someone out of a Tennessee Williams play. Crazy, but weirdly compelling. Sam will vote for Tyler for sure she hates or doesn’t like literally everyone else lol. Don’t you think she likes JC? lol. She doesn’t know why she is there, but she has fallen for Tyler and will do anything he says. She will also vote for him if he is in the end. The usual lies from Sam. She absolutely wants to win. Before the ist jury member left there was no sucking up to them. Ist jury member…Bayleigh. Sucked up..gave the sole vote to stay..and shouted out to her that she, Sm, was the sole vote. Begged not to be on he block. And..if in the position to choose..she will NEVER take Tyler. I get the iying..I get the double and more final 2 deals. What I find so distasteful…is the BS of what a wonderful, self sacrificing person she is. I like Kaycee and Brett a lot. Also Tyler. And in the end..I don’t think anyone would take Tyler except for Angela. Tyler surely knows this and I agree, they’d be foolish to take him. He’s got a balancing act to do til the very end. Love all four of them and do not want Sam at the end. I could see The Hive giving it to her which would be another stain on the entire game. To get L4 jury votes, they have to keep each other til final 4. Absolutely. Sam has sucked up to ALL jury so far. Today spent 6 HOURS with Scottie. No question..this is a VERY bitter jury. They’re not considering game play at all. What is mind boggling..is that they were an alliance. But G-D forbid there was another alliance. That made any other alliance..THE DARK SIDE. In essense..anyone not on THEIR side is bad and undeserving. Yes to final 4 of Tyler, Brett, Angela and KayCee. However…The Hive will be Ok with anyone other than Tyler and or Angela. Yep that’s why they’ll get Tyler/Angela……lol its a win win for L4….. They showed her outbursts tonight for the first time, somewhat of a montage. When she’s in a mood, she really does bite everyone’s heads off for no good reason. And when she’s not in a total mood, she gives passive aggressive digs. But (in my opinion) no where as nasty as Blockstar or Bay; or houseguests from previous seasons (especially the one that shall not be named). Perhaps it’s also the affect of being together now for 2 1/2 months? I’d think nerves would be shorter for everyone the longer they are together and closed in. I don’t think she cares about any relationships in the house. It’s all manipulative imo. There’s something very strange about how she got on the show. I’m sure she’s a superfan and applied. And went with the Donny persona. But she’s no Donny. She’s away with the fairies for sure. But sly as a fox. I would not trust her as far as I could throw her. That’s for damn sure. And the mud hole in the chest and beheading the beetle to see if it would regenerate. Shades of Josef Mengele. Gotta give Haleigh some props, even though she’s made nothing but bad moves, bad alliances and bad showmance’s, she kept her cool and keeps chugging along. I agree, and I’m continually impressed by her. She is older than her years. She won’t win this game or fan favorite, but I’m proud she’s a fellow Texan. She just needs to find her “y’all”! Bless her heart! I can’t help but root for the east Texas girl a little bit. Her Daddy is gonna love Fester. I wouldn’t say she made bad moves. It was her own alliance to blame. It wasn’t her fault when Kait failed her own puzzle, when her nominations got hacked, when Rockstar threw it to Tyler, or when Fes put up Scottie. Every f* up was out of her control. She was a part of that alliance and went along with the choices made. I guess you can give her kudos for staying aboard a sinking ship?? Mick- that’s not true. She blew the hacker comp that she won by taking down Scottie instead of rockstar ( at that time Scottie was really aligned with them and had just spent the previous hoh glued to L6 sides). She was so worried about trying to be sneaky and making sure nobody figured out she was the hacker that she took down someone from the other side of the house to replace the nom leaving her alliance member on the block. She should have taken her alliance down and just denied it. It ended up causing so much trouble that she had to reveal she was the hacker but she felt bad about Bayleigh being blamed for it. i’ve never really felt taking down scottie was that horrible a game move. the plan was always to backdoor bayleigh any way so it didn’t matter who hayleigh took down (though in fairness she didn’t know that). choosing kaycee to play in the veto was dumb though. she should have picked fes. JC may be putting in more effort but that effort is costing him and moving him up the eviction ladder. JC just won’t give it a rest!! Not even for a second! Every since he walked threw the front door he has been going nonstop! He is constantly so busy making movies & in everybodies hear until I’m literally worn out just watching him & even hearing his voice! I wish he had a showmance to distract him momentarily b/c I need to catch my breathe! Lol! I don’t believe his roller coaster ride will stop until they reward the winner with the $500k check! We all know that won’t be him. Lmbo! Hoping he gets caught up in the double eviction web! Show on CBS tonight showed Crazy Sam – it was awesome. Also JC out of control. I think they gave Haleigh a better than deserved edit. They showed Tyler’s straight hair and flipping out (funny still). I know the feeds must be slow; After Dark is as well, but it’s like this every season as the numbers diminish. There’s only so much you can talk about after all this time. I wouldn’t mind them sending Haleigh out before Scottie. Six of one, half a dozen of another. “She hung on that rope lie a d#@? parasite.” That was funny! So funny that Sam used the word parasite to describe her. I laughed at the entire statement. But she could have used a more positive word but nope. Exactly how she feels about her. So funny. Part of the boring phase right now is the fact the next couple of evictions are set as far as L6/5/4 is concerned so there is not the usual scrambling and covering the vote. I think once the next person, Haleigh, goes things start getting interesting because that means both Sam and JC are the targets and the veto is the power from then on out. I’m gonna miss Scottie in this house. I will spend the rest of this season campaigning for AFP. I just had a vision that Kaycee is Big Brother 20 winner. All the campaigning in the world won’t help him win AFP. afp is pretty wide open assuming tyler makes it to the end (which is a relatively safe assumption). most of the players are dumb, boring, jerks, or some combination of the three. 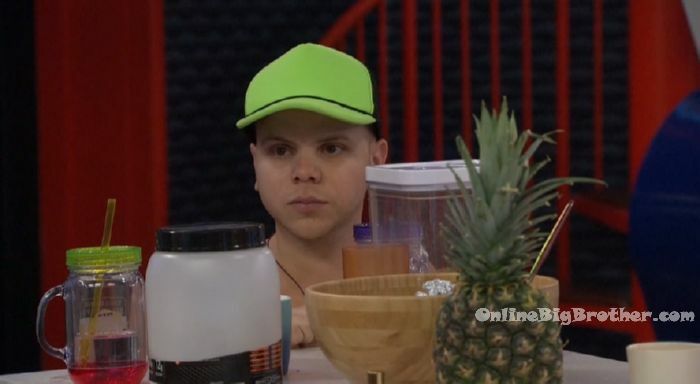 i really don’t want jc to win afp, but i imagine he’s the frontrunner and i’m willing to vote for pretty much anyone else still in the house over jc (the 3 current jurors not so much). Vote Fes for AFP !!! LOL. She was sure it was the plan to vote her out last week too. And the week before that. I like the point game Tyler and Angela are playing. My absolute favorite moment of tonight’s episode was when they kissed, the scene switched to the HoH door and we heard; ding, ding, ding, ding, ding, ding! Oh how I would love it if Tyler waits til last minute. Gets everyone to vote Haleigh out and leaves JC the only vote to get Scottie out. Then if Scottie wins HOH, he goes for JC knowing Sam would vote Haleigh out for sure. And knowing jc was the one in fes’s ear. Turn the rogue voting on JC. Feeds sure would be fun then. A person can dream. I’m seeing JC on the block next week no matter what. Well unless Haleigh wins HoH and actually nominates 2 folks from L6/5/4. I’m not sure she’d break from tradition though. How can she manage to get voted out during her own HoH? Somehow I think she could pull it off. Lol. there’s a chance it’s sam and hayleigh, but sam’s such an obvious guaranteed hayleigh vote who definitely won’t use veto to save hayleigh that i think jc makes the better pawn. jc might not even flip out that much on the block with hayleigh the target. i do think jc gets voted out in 6th though. he could actually win the days comp. sam has almost no shot at it. Ohhhh I like the way you think :) I like JC sometimes but I can’t WAIT till he’s on the block! He will be a big baby. He is so devilish when anyone else is chosen. A big whiny baby is anyone suggests he be a pawn. At this point I keep going back and forth between Tyler and Brett. I would like to see either of them win. Right now I am on a Brett kick…..I think he is playing a good game and even though he hasn’t won HOH he is in a good spot and his DR’s are so funny. But after tonights show I am starting to like Kaycee and wouldn’t mind if she won. Actually I wouldn’t mind is anyone from L6 won at this point, well may anyone BUT Angela. The only person that I really don’t want to see win is Scotty. I don’t really care for him and his voice is like nails on a chalkboard especially when he is in the DR. 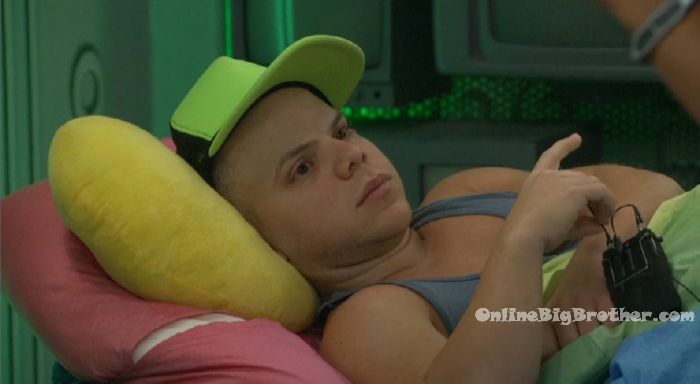 I hope that he goes home this week but I’m worried it’s going to be Haleigh. 2 Weeks left and 7 people in the house? Quick question, because I have been in work hell lately and haven’t had time to do much on the site. Doesn’t the season end on the 19th? By my count thats two weeks with still 7 people in the house. How are they going to evict 4 people in less than two weeks? I believe the show is extended by a couple weeks this season. Finale is on the 26th. What the Hell happened to the epic veto speeches?? Why didn’t we see them on tonight’s show??? I had this doll when I was younger that was a Big Bad Wolf, but when you flipped it over and pulled its fur over its head, it became Goldilocks in a skirt. That doll messed with my mind and likely led me to study psychology in college. Every time I watch Sam, I picture that dang doll. My point is… I can’t trust Sam. Anyone paired with Brett would make a great DR session. That guy is wicked funny. Although I think the house should get rid of Haleigh, Scottie is the bigger threat and would definitely put up two L6 members. Haleigh can be eliminated next week (or maybe the DE). The most interesting week would come from Haleigh, Sam, or JC winning this next HOH. I imagine Sam will gun for it now that Tyler told her there is talk she’ll be the next target. L6 wants Sam as long as they can keep her. If Sam is put on the block, we could likely see her start crafting bottle rockets…disguised as a new habitat for Charlene, of course. Sam has promised we haven’t seen how crazy she can get, YET. So, I’m hoping Sam ends up on the block. I want to see how that would unfold. To make things even more interesting, I’d like to see JC next to her. That doll would freak me out. I had a Mrs. Beasly doll that had to sleep in my closet at night. I so want JC on the block. He’s the only one who’s won nothing. Sam and JC on the blocK would be entertaining. Who would do that though? 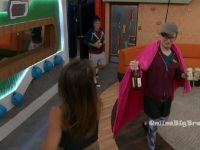 It’s sad that Bb has to give them alcohol because the feeds are so boring now! That’s the only way mangela will kiss Tyler lol! So fake! Please BB Gods evict the lampshade Mangela next! Sam is going to be heartbroken when she finds out Tyler played her. JC just over played his hand. His paranoia about a double eviction tomorrow led him to talk to Sam about taking out the girls. 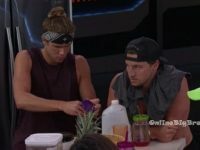 JC once again doesn’t realize Sam is going to tell Tyler what JC said. been reading everyone’s comments for a while now. i think they need to get Hay out now. i wouldn’t trust that girl as far as i could throw her. you can’t tell me she wouldn’t put up to 2 of L6 if she got the chance. she may hate Sam but there are bigger targets in the house. She pulled a crying jag last night over some comment Brett made which got instant sympathy and petting from Angela and Kaycee. That’s how you start to divide the house and get votes on your side, Angela and Kaycee were against Brett last night and all on Hay’s side. Little brat is crafty as heck. Fes & Haleigh went to Angela and Tyler. Kaycee – oh… Scottie – you didn’t hear about all this? Kaycee – Ahhhh.. nooo. Scottie – that’s why you were the one that got put up because they were trying to show they could trust those two (Angela & Tyler). In that meeting I was still on the block and those two (Fes & Haleigh) were supposed to be on my team. I heard that I got thrown under the bus in that one. Kaycee – who told you about that? Scottie – literally four people told me about it. I thought that got spilled while I was away. I thought everyone knew. Kaycee – no I knew about them being up there talking but I didn’t know about the final four. Scottie – well Tyler and Angela shut it down because they knew they only wanted safety. And that last bit is why Scottie is WAY dumber than Fez. At his core, he’s just a rat with no clue how to exploit info…just how to run and tattle. Tyler tells Kaycee Hayleigh is going, then turns around and tells Ang Scottie is going. Is he trying to split the votes? Or can’t he keep up with his lies?